Twitter has today launched a new section on its website for developers on its platform. It’s designed to help them keep track of the ever-changing API that they use to interact with Twitter. 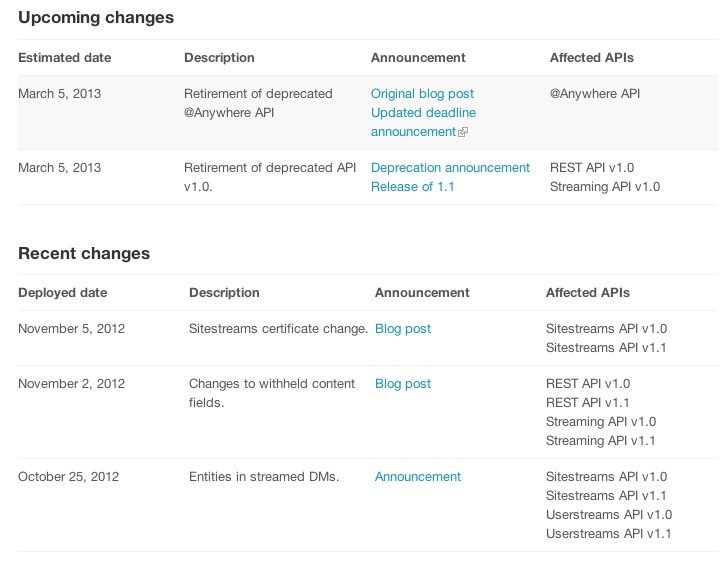 The API is undergoing many major changes when version 1.0 goes away completely next year, but there have been misunderstandings about exactly when developers need to begin complying with the changes, and this calendar is an effort by Twitter to make the dates of those changes clear. The Calendar of API changes won’t be all that exciting for most of you, but it’s going to make a difference when it comes to the businesses of some developers. For instance, back when Twitter announced compliance dates for its upcoming Display Guidelines, some developers were taken by surprise when its October 5th deadline rolled around. Since its announcement of the major changes coming in v1.1 of its main API, Twitter has been criticized heavily for developers. Not just for the changes, but also about how opaque it had been about the changes. This calendar is an effort to at least clarify and codify when business affecting changes are going to actually come into effect.